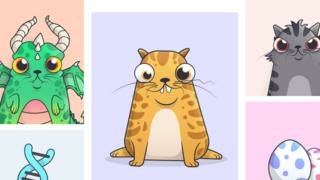 A new craze for virtual kittens is slowing down trade in one of the largest crypto-currencies. CryptoKitties lets players buy and breed "crypto-pets" on Ethereum's underlying blockchain network. The game's developers told the Bloomberg news agency that CryptoKitties was a "key step" to making blockchains more accessible. But its popularity has underscored one of the technology's biggest downsides: its lack of scalability. Etherscan has reported a sixfold increase in pending transactions on Ethereum since the game's release, by the Axiom Zen innovation studio, on 28 November. "CryptoKitties has become so popular that it's taking up a significant amount of available space for transactions on the Ethereum platform," said Garrick Hileman, from the University of Cambridge. "Some people are concerned that a frivolous game is now going to be crowding out more serious, significant-seeming business uses." An estimated $4.5m (£3.35m) has been spent on the cartoon cats at the time of writing, according to Crypto Kitty Sales. Think of these rather unpalatable cartoon kittens as unique digital Pokemon cards. The game's developers describe them as "breedable Beanie Babies", each with its own unique 256-bit genome. These crypto-collectibles are also gender-fluid, able to play the role of either the "dame" or the "sire" when bred together. The kitties' unique DNA can lead to four billion possible genetic variations. Some of the varieties created so far look lifelike, with grey striped fur and bulging green eyes. Others are speckled with neon-blue spots or magenta-patterned swirls. How much are CryptoKitties worth? At the time of writing, the median, or mid-range, price of a CryptoKitty is approximately $23.06 (£17.19), according to Crypto Kitty Sales. The game's top cat brought in $117,712.12 (£87,686.11) when it sold on Saturday, 2 December. How can I pay for my own litter? CryptoKitties can be bought using only Ether, a crypto-currency that acts as the fuel of the Ethereum blockchain network. To get started, users must install a Chrome extension called MetaMask, which acts as a digital wallet and lets players send and receive Ether from their computers. Ether must be purchased from a crypto-currency exchange before it can be added to MetaMask. Where do the CryptoKitties come from? Axiom Zen releases a new CryptoKitty every 15 minutes, but the rest of the supply is powered by the breeding of existing crypto-pets. Owners of kittens can put them up for sale and set their own price in ethers. Why does it matter if CryptoKitties is slowing down Ethereum? According to ETH Gas Station, the CryptoKitties game accounts for over 10% of network traffic on Ethereum. As traffic increases, transactions become more expensive to execute quickly. "The real big issue is other major players looking for alternatives to Ethereum and moving to different systems," Mr Hileman said. "There's definitely an urgency for Ethereum to try and address this issue."